As I said in my last post, I've been working on a lot of terrain lately. Mostly in my downtime when I wait for the Zombies of Karr-keel (which I finally finished, photos soon!). 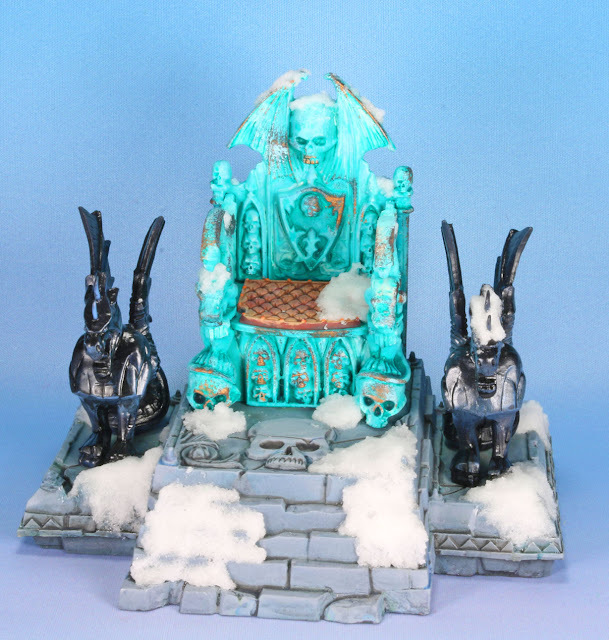 Anyway, I picked up Games Workshop's Magewraith Throne as I thought it would be perfect for Frostgrave. At $15, it was too good a deal to pass up. The only knock on it is that it was originally part of a different piece and it has two tabs that stick out below the base, which have to be cut off. 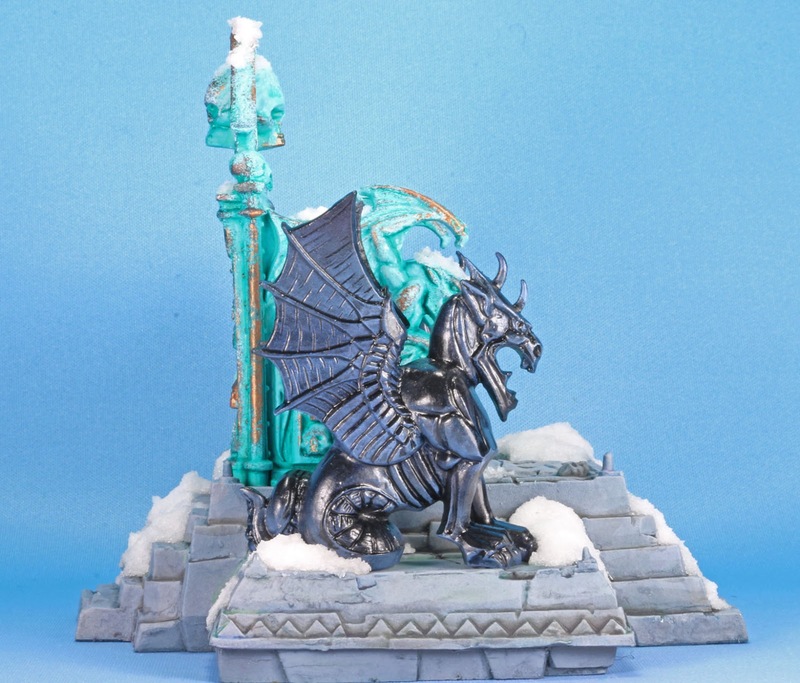 The stone base was airbrushed beginning with Vallejo Model Air 71.054 Dark Grey Blue and highlighted by mixing in Vallejo Game Air Wolf Grey and then White. Each highlight was applied from a higher angle to create a zenithal pattern. After that, it was hit with various dark oil washes, and pooling was cleaned up with a little thinner. 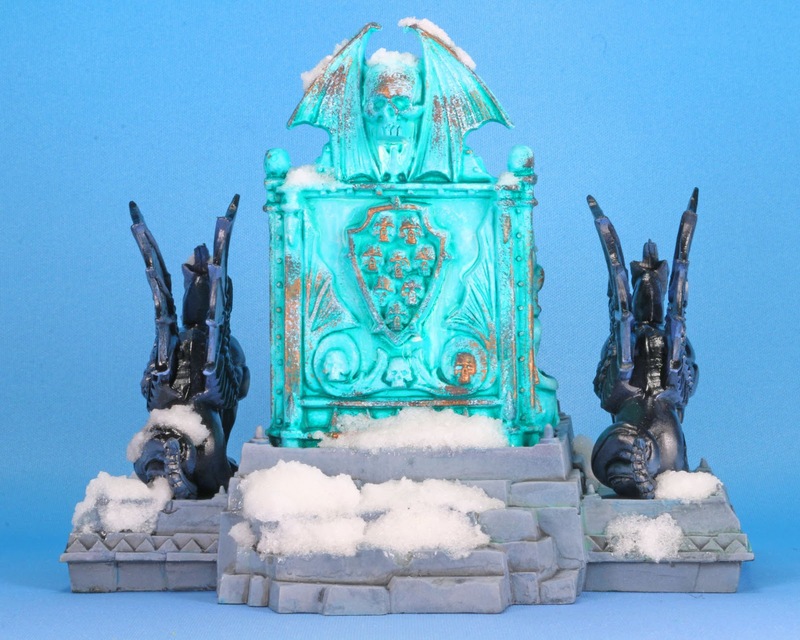 The throne itself was intended to imitate and was initially airbrushed with Citadel Hawk Turquoise. I then sponged on various turquoise and white mixes and various green-blue washes to simulate the verdigris texture. Then I sponged on Vallejo Game Color Brassy Brass to create some spots where the verdigris had been worn off. The cushion was Citadel Khorne Red highlighted up by mixing in Citadel Kommando Khaki. The statues were intended to look like onxy and were painted black and "higlighted" by mixing in space wolf grey onto the lower points, since shy objects tend to reverse the where the brightest part of the object is. They were finished off with a heavy gloss coat. The snow was applied by mixing in Woodland scenics snow and Liquitex Gloss Varnish into a paste. Normally, I use Tamiya clear because it looks better. But, this was a lot of snow and Tamiya clear only comes in small, expensive bottles. If I had it to do all over again, I'd leave off the side statues, but overall I'm pretty happy with it. The idea of a giant, ancient throne sitting in a square in Feldstadt where some ancient wizard conducted business. I love the whole composition and the way it looks. Bravo! 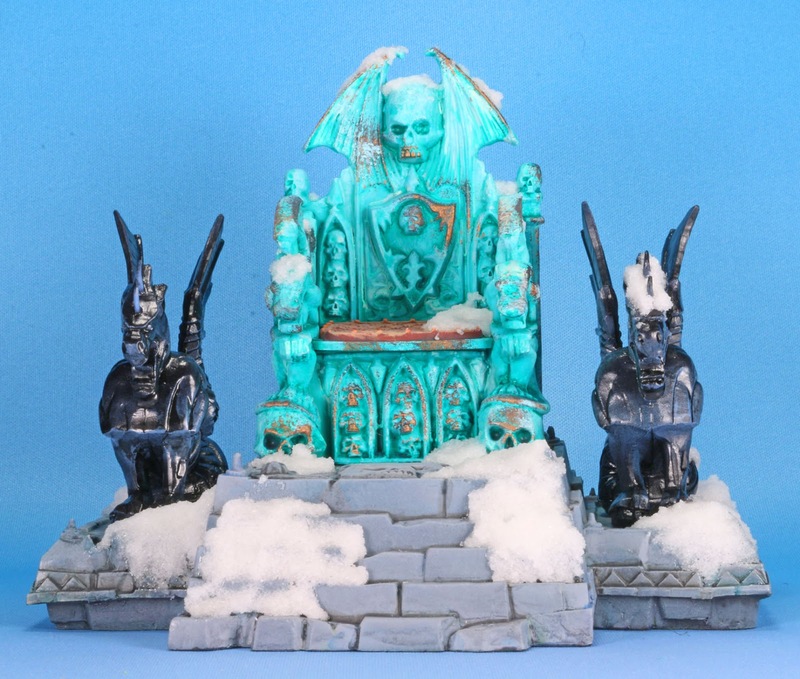 It's a great kit, especially for the price and really just screams frostgrave to me. Nice! I think $15 is well worth it, might have to pick one up. I like you take on it and your snow effect looks quite good. Agreed, at that price point, it's to good to miss.